It’s been replaced by chicken, in these tasty meatballs from Coleman Natural, ready to heat and eat. Coleman Natural’s Gourmet Chicken Meatballs are antibiotic-free, hormone-free, preservative-free and vegetarian-fed. They’re gluten-free and soy-free. They’re better for you than conventional beef or pork meatballs. See all the different things you can do with chicken meatballs in hors d’oeuvre, appetizers, lunch, dinner and snacks. Learn why chicken meatballs are a better choice than beef or pork meatballs. And decide which flavor you’d to start with: Buffalo Style Chicken Meatballs; Chipotle Cheddar; Italian Parmesan; Pesto Parmesan; Spinach, Fontina Cheese and Roasted Garlic; or Sun-Dried Tomato Basil Provolone. 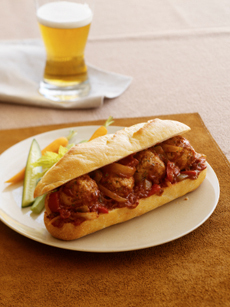 meatball hero. Photo by Jill Chen | IST. Read the full review of Coleman Natural Chicken Meatballs. Find recipes and product reviews in our Gourmet Poultry Section.